Jennifer Birkett, Margaret Storm Jameson: A Life (Oxford University Press, 2009). Jennifer Birkett, Undoing Time: The Life and Work of Samuel Beckett (Irish Academic Press, 2015). Peter Brooker, Sascha Bru, Andrew Thacker and Christian Weikop (eds), The Oxford Critical and Cultural History of Modernist Magazines. Volume III: Europe 1880-1940 (Oxford University Press, 2013). F. Matthew Caswell, Three Master Musicians: Medieval Islamic Music (Matador, 2013). 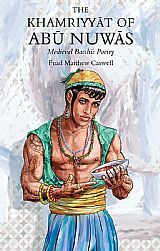 F. Matthew Caswell, The Khamriyyāt of Abū Nuwās (Troubadour, 2015). Catherine Clay, British Women Writers 1914-45: Professional Work and Friendship (Ashgate, 2006). Katharine Cockin (ed. ), The Literary North (Palgrave Macmillan, 2012). Tony Crowley, Scouse: A Social and Cultural History (Liverpool University Press, 2012). Paul K. Jones and David Holmes, Key Concepts in Media and Communication (Sage, 2011). Deborah Philips, Fairground Attractions: A Genealogy of the Pleasure Ground (Bloomsbury Academic, 2012). John Astley is currently revising and extending for re-publication his book Access to Eden, a study of the interrelation between the Arts & Crafts and Garden City movements and the 1924 Wheatley Housing Act (the birth of council housing). The original version of Access to Eden was published by Information Architects in 2010 (ISBN 978-0-9556638-3-3). F. Matthew Caswell has a doctorate in Classical Arabic from the University of Oxford, and has had a long career as a barrister. The collected short stories in Menashi’s Boy, while not biographical, reflect the three phases of the author’s life. The title is derived from the story of that title, which may be seen as an allegory of the Israeli-Palestian conflict. Jenny Cunningham writes: I am involved in Social Work Education, specifically Social Work Practice (direct work with people.) I heard about Raymond Williams when I read a Social work book titled Social Work as Art, by Hugh England. I read this book about twenty years ago, when I was a Social Work student. I was immediately inspired by the references that England made to The Long Revolution and how relevant it is for Social Work. I am sorry to say that Social Work seems to be increasingly concerned with processing information, as if people can somehow be ‘read’ by a clustering of ‘so called’ facts about human experience. I find the way that Raymond Williams explores ideas about culture and power really interesting. I am also a storyteller and have particular interest in the content in (metaphor and symbol) in traditional ballads and stories. David Forrest writes: My interest in Raymond Williams stems from my PhD (completed 2010), which sought to explore the continued use of realism within British cinema, but is maintained through my current projects, particularly my next book which is a co-authored monograph (with Sue Vice) Barry Hines: ‘Kes’, ‘Threads’ and Beyond (Manchester University Press). Our exploration of Hines’s work focuses on a number of themes which might be seen to connect to Williams’ theoretical project, specifically an examination of working-class culture, in the broadest sense, and a an understanding of the complex dynamics of urban and rural landscapes. Paul K. Jones is Associate Professor of Media & Cultural Sociology, University of New South Wales. He has published widely on the relevance of Williams’s work to sociology and media/communications studies. He is currently engaged in research on populism, employing Williams’s social formalism. The Raymond Williams Society in Japan website. BAMS aims to bring together all those in the UK interested in modernism, and to connect outwards globally.